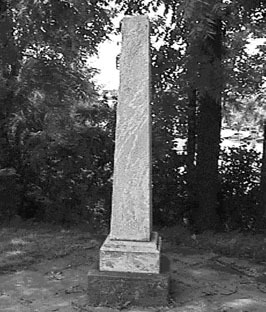 The monument was originally erected in 1865 in Westwood Cemetary, but, in 1971, was moved to Martin Luther King, Jr. Park on E. Vine St.
"These colored citizens of Oberlin, the heroic associates of the immortal John Brown, gave their lives for the slave. Et nunc servitudo etiam mortua est, laus deo." "S. Green died at Charleston, Va., Dec. 16, 1859, age 23 years. L. S. Leary died at Harper's Ferry, Va., Oct 20, 1859, age 24 years." Click here to learn more about James Monroe and the events at Harper's Ferry.